She’s 13 now. 13 and a half (and change). But who’s counting? Sofie stands now five foot four inches. That means the child I brought back to Chatham when she was 13 months and grew up amongst us, learning to swim, skate and sail, and earning her black belt, is now less than a foot shorter than me. That seems like a milestone of sorts. The summer population of Chatham was the margin of victory in the state of Michigan’s 16 electoral votes. I was 10 years old for the first presidential election I can recall, Ford vs. Carter. In November of 1976, I was sorely disappointed Gerald Ford didn’t get a chance to serve a full term. It was so close. I said I would not refer to Jimmy Carter as “Mr. President.” He was not my president. I was 10. Six million Democrats chose to not to show up for Hillary Clinton on Election Day. Sofie has been keeping track of this election season for a year at least. She chose to support Bernie Sanders, despite or because I did not express my preference for an individual. It’s important, I feel, to have an open, honest discussion with loved ones about issues. There’s no accounting for how that manifests itself in preference for one candidate over another. Over one third of Hispanics chose to vote for Donald Trump, and overall more people of color voted for him than Romney in 2012. It is hard to think how much has changed, how much we have gone through since this day last year. Even if the outcome were inevitable, the process seems to have been chosen for maximum cruelty to us all. And then being asked to just be quiet, accept it and move on. A majority of college-educated white women did not vote for Hillary Clinton. But you don’t learn anything that way. There’s no growth, on either side, if you don’t reflect as to why this turned out the way they did. Hillary Clinton received over 1,000,000 more votes than Donald Trump. In the past two weeks, there was a lot of good writing, led by David Wong (on, of all places, Cracked), regarding how out of touch the Democratic Party, pollsters and the media has become about the state of economy across the country, and how that led Americans to seemingly vote against their best interests. Families desperate to cobble together an income from a few part-time minimum wage service jobs and who just lost a child to a drug overdose were told to somehow put their faith in a candidate who represented the status quo over the one promising to blow up the system. Over 40 percent of voters cast no vote for president at all. No candidate approached even 30 percent approval of all registered voters in the country. Moreover, they were told if they didn’t, they were racist and misogynist. Pigeonholing is a no more effective tactic for winning hearts and minds here than in the Middle East. In enough cases, these voters either chose to overturn the card table or stayed home. Millions of alienated voters spread across the states Democrats needed to pull off the necessary Electoral College victory. By not even going to Wisconsin, Clinton signaled that the voters there were not important. They, by a razor thin margin, returned the compliment. If you then call them racist, you insure the same result. Kindness and grace. Those are the words I chose to use in social media on Wednesday, Nov. 9. That is what I asked for, and that is what I gave. Kindness from those who felt victorious. Grace from those who did not. Frustration and resentment is understandable. For quite some time, Clinton supporters were fed a story that was built upon truths, but essentially untrue. Election Day was the crucible. Anger is a completely normal reaction when one has been deceived. They get to express that – civilly – just like the people who have been economically marginalized, diminished and dismissed still get to express their dissatisfaction in the only way they have been given. And while they process their grief, it is all well and good that they protest. Donald Trump enabled a climate of hostility towards anyone who is perceived as “other.” Real racists, sexists, homophobes and bigots have been emboldened to take their private prejudices out and exercise them in public. There are countless incidents of cruelty that is, well, un-American at its core. This is not who we are. It is not unkind to criticize. We often confuse manners with caring. Or character. Yet social media allows us to create different realities and echo chambers where we get to shut out the voices that make us feel uncomfortable, hold up views that do not reinforce what we feel are wise, enlightened choices. We chastise. We argue. We unfriend. We block. Then we pat ourselves on the back and bask in the praise of all our right-thinking friends (who remain). Which is reminiscent of what Donald Trump has done. To treat those who will not support him abominably, then claim victimhood when on the receiving end. In this past year it has been frustrating to hear this, and then ask, “Well, which is it? Are you a strong, tough person, or are you a helpless victim?” It’s not as if he didn’t choose this path, after all. Not that this hasn’t been employed by Democrats. Trump just turned up the volume.We at least saw kindness and grace from Hillary Clinton. She made the call to Trump and then she accepted the results. Trump praised her on 60 Minutes this Sunday. He also seemed floored by President Obama’s treatment of him at the White House. Dare I say it, Donald Trump may have never encountered such a demonstration of nobility, and it looked like it affected him profoundly. Adults modeling admirable behavior, that’s what I want my daughter to see. This past year, she’s had a tough year of the opposite. She’s been let down, horribly. She will carry this disappointment with her, and so I look for examples of better behavior. I can show her now, at least, how the two opponents have put away their weapons and turned on a dime. To accept and shake hands and move forward. To the values of nobility, kindness and grace. Read more at the Cape Cod Chronicle. It wasn’t the brilliance that captured our attention. It was what was in the sky. Every morning, since April, I have been taking a moment to drive down to the overlook at Lighthouse Beach and check in. It used to be a habit of mine, years ago, to once a weekend drive to various town landings around town and see how things were going. Not there for more than a minute often. Just an exercise to touch base, like a child might with cherished toys, to reassure that these hidden gems were still there. Forest Beach, Harding's, Sears Point, Old Mill Boatyard, Bridge Street, the Dike, Water Street, Claflin Landing, the Cow Yard, Cotchpinicut and Ministers Point, Strong Island Road, and Jackknife. Ideally with a hot chocolate. Sunny days were great, being able to see the surf far off, or a stray boat on the horizon in the off season. But it was the days when the spitting rain, driven by a northeast wind that buffeted my little land craft, that turned this from a simple regular exercise into a necessity. Tidal and storm erosion could change things overnight. That’s what living here on the elbow teaches you. Expect loss. The cemeteries here offer centuries of heartbreaking testimony. Tombstones carved with the successive death of children before their parents’ own. Husbands and wives suddenly lost at sea or taken by illness. Some graves have no bodies. By early April I had made a habit of parking at the overlook on and off, to take a few photos, eat a muffin and drink my coffee, and generally collect my thoughts. Any one of those is a good enough reason to make that a regular stop. There are few places around here so expansive in view and similarly accessible. No wonder that so many TV trucks from far and wide use it as a backdrop for reporters talking about hurricanes and shark attacks. I had come here early in April, late on a Saturday morning, pulling into a spot near the northernmost pay binoculars. It was one of those early spring days that promise more of June than January. The ocean and beach before me, the lighthouse to my right, and the Mack Memorial to the drowned sailors and life savers of the Wadena Disaster behind me, it was easy to savor the blue of it all. While I snapped a photo to share this scene with friends far and wide, a new icon came up on my Facebook. It said “LIVE.” Which I took to mean like a live broadcast, although it could have meant live, as in I live under a bridge but it is OK because at least I have a roof and decent WiFi. Thus began, with increasing frequency, my daily series Cape Cod Coffee Break. Typically in the morning, typically at the overlook (at the same parking spot), typically only a couple of minutes and typically with a inexplicably poor 4G signal from Verizon. A little report on the current weather conditions, followed by shout outs to friends with birthdays and perhaps a mention of something interesting happening. Every once in a while, a friend might show up, or more recently people who have been watching. What’s particularly nice is making new friends from far away who recognize the view. But I’ve been thinking about something more. By casually documenting the conditions in this one spot every day, I’m creating a log. Weather and shore conditions. The sea and sky and beach. So while I am mentioning the birthday of NPR’s Jack Speer or walking over to the plaque relating the diverted voyage of the Mayflower to the mouth of the Hudson, there’s a realtime dataset of the conditions being permanently stored for this location. Presence of seals across the channel. The narrowing of the channel entrance. The number of tour buses. And the clouds. We especially notice the clouds. This summer, with a prolonged and devastating drought, I reported that there was no warning flag for mariners flown at the Coast Guard Station. Day after day. Likewise, bright, clear days of endless horizon and blue skies. The grass turned to thatch. It was clear but became uninteresting. Finally last month the clouds returned, with the drama of the repressed. Puffy cumulus racing north to south. Total cover of heavy mist. Last evening’s crescendo of stratus, reflecting the sunset and later surrounding the Hunter’s Moon as it rose from the sea. It was that last that gave me pause to consider. Having a few very busy mornings, I had to delay my broadcasts until the late afternoon. Seeing the beach from this other perspective, with the sun behind the lighthouse, the beach reflecting the light, I chose to go to Harding's Beach at dusk. We are now in the days of the 6 p.m. sunset. Much like early April, this time around an equinox seems to hold the best clouds. Their beauty is totally in reflection, and often to obscure the light. Or to diffuse that energy. Much like the moon, they hold none of their own. We notice most especially when there is nothing else. The solitary cloud, sitting seemingly poignant in its placement, seemingly immobile in the blue or the dark on a random patch on our ceiling. They fascinate, looking down from a plane, or up from our place on the ocean or land. Ephemeral, they look eternal. Insubstantial, they look solid. When I am able to take a photo, their paintings on the sky make it more interesting. A distraction from seeing further. As I head to my next coffee break, I see another clear blue day outside. No clouds. No rain to come, for now, but no hiding the true warmth of the sun on the Cape Cod waters and sand. This too shall change, and we will check again tomorrow. Read this and other columns at capecodchronicle.com. This is a special kind of snow. It lies untrod upon across the yard like an animal’s coat, rather than a blanket. It seems to have grown out from the land rather than having been laid down from above. Soft, almost furry, there is no sense of warmth at all. The air is crystalline. Floating around the low single digits, if not below, the air temperature will not allow for any humidity. Yet the other night we had flurries. Fog, the radio suggested, out here, closest to the ocean’s mediating embrace. Fog at six. Fog at four. Fog at two. Fog at nothing. There is no fog when it is this cold. Not for very long, at least, and it changes to flurries. What comes down is the lightest precipitation one could dream. It barely falls at all, but swirls up and around, and down and back. Tiny, individual snowflakes, each with their own agenda, their own chaotic purpose. The landscape of yesterday and last week, once a collection of ice and snow patches that had been covered once and never melted, is softened again. It can be swept away with a broom, or blown with one’s mouth. Off the front steps and the rear window and sideviews. There are no footprints on this snow. Days of sledding and romping and racing and snow creatures were melted away two weeks ago. The next round of winter, the real coming of the season from the second of our weekend blizzards, grew this white coat and brought the banishing cold of this weekend. It was not without warning. Looking through images of last year at this time, the snow heights are higher. That brutal year encased us, though, getting us used to how very cold it would be. We were lulled this year. El Nino, the child, suggested we might go the whole three months without a real sense of cold. Berries hung on the privet still. Radiant light green grass still grew on dewy banks. Winter was not happening. We could get through this easily this time. As if we had earned a respite. Winter is to be expected. Here, it will be cold. We know this when we chose to make a home here. We count ourselves lucky when things go well, the warm days, the sunshine, the green fields to amble through. We congratulate ourselves when spring comes and we made it through yet again. We believe warmth is normal. The beach parking lot looks out. The blue of the sky is one complete shade, the blue of the water a deeper one. Fewer cars are out even though the air is brilliantly clear. The horizon stretches out, cloudless. Whitecaps hit the outer beach, which hangs on by a thread. It is too thin. Is it high tide or low right now? Washovers, spillovers are not singular events, it seems now. It is not so much a breach to envision but a total disappearance of the sand. It is in motion, below the surface. In the spring it will show up elsewhere. The wind buffets the few vehicles here. It has blown the windshield clear of the clean, silty snow. A coffee cup and a running engine keep zero at bay for humans. Few have ventured forth. It is blindingly cold out. Even the faintest breeze is like a knife. That spring will come, we know. That is a different time. In February, now, it can get colder. This is when we have been reminded, at last. A snow shovel. A parka. A pair of boots. A load of firewood. We have prepared, we think. This time of year reminds us how precarious we truly are. No other time of year can we walk outside and die. It is not the snow. It is the cold. We know the natural state of things, the original state of the universe. It is to be different from what we would like. It is within the distance between planets. Cold is the natural state. Warmth is the anomaly. What we see at six is closer to the truth. This is not a season. This is as it truly is. This could be the best to ever expect. At six. After a shipwreck on Bermuda, encountering the colonists-turned-cannibals of Jamestown, and surviving the deadly first winter in Plymouth, a walk through the Bridgewater Triangle might have felt like a walk in the park for Stephen Hopkins. But grueling 50 miles from Plymouth Rock to the Massasoit Spring in present day Warren, RI – by foot, in two days – remains challenging four centuries later. Now the Gumshoe Historians of PBS are retracing the route taken by Hopkins and fellow Pilgrim Edward Winslow, led by the Native American Squanto. Part of this journey will be featured in Hit and Run History’s “Stephano: The True Story of Shakespeare’s Shipwreck” coming to Rhode Island PBS in 2016. The trek was a mission of peace and diplomacy by the newborn English colony to the great sachem of the Pokanoket (now Wampanoag) tribes, Massasoit, at his home village of Sowams in the 1621. But it bears an eerie resemblance to another trio in Shakespeare’s final play, The Tempest. It was a work inspired by Hopkins’ own misadventures on the “Isle of Devils” a dozen years earlier. Squanto will be joining HRH for this journey, in a fashion. Christian Wessling, a member of the Wampanoag tribe, portrayed the young enslaved Tisquantum (Squanto) in the educational exhibit “Captured: 1614.” Funded by Plymouth 400 and produced by the Indian Spiritual and Cultural Training Council and SmokeSygnals Marketing and Communications, the installation brings to light a history with a monumental effect on the Wampanoag tribe, their relationship with the Pilgrims, and the founding of Plymouth Colony. Between 7 and 8 AM on Tuesday September 15, HRH’s crew will rendezvous at State Pier in Plymouth, near Plymouth Rock and the Mayflower II. They will then head west along what was the Nemasket Trail, through Plymouth, Carver and Middleborough. They will cross the Wading Place at the Taunton River on East Main Street (Route 105) early in the afternoon. Taking a break in Middleborough, they will proceed onwards to Fort Hill, just south of Pratts Bridge over the Taunton River on Vernon Street. As Hopkins’ party rested nearby for the night, HRH will break at sunset. On Wednesday September 16, HRH will take up the remaining 25 miles of the journey, following the river roads through Raynham and Taunton, and the old Bristol Trail south through Dighton, Somerset, and Swansea, Massachusetts, until finally crossing the border in Rhode Island in the town of Warren. Their destination, the Massasoit Spring, lies at the foot of Miller Street, across the water from Barrington, RI. Fans can track of their progress via their Instagram feed. In December, Hit and Run History was awarded a $10,000 pre-production Massachusetts Foundation for the Humanities grant for Stephano. In January, it became the first joint production of Rhode Island PBS and the Cape Cod Community Media Center. Shakespeare. Shipwrecks. Squanto. They’re all wrapped up in Hit and Run History’s latest project. And on the evening of March 20, the Cape Cod Community Media Center will host the live broadcast of HRH’s launch of the crowdsourcing campaign for Stephano: The True Story of Shakespeare’s Shipwreck. So far, Cape Cod’s Gumshoe Historians have been on a winning streak. In December HRH was awarded a $10,000 pre-production grant for Stephano from the Massachusetts Foundation for the Humanities. Two weeks later, Rhode Island PBS committed to broadcast Stephano -- once it is fully-funded. “Since then,” says HRH creator and producer Andrew Buckley, “we’ve been going everywhere to film our promotional trailer. Plimoth Plantation, the Jamestown Settlement, the Folger Shakespeare Library in DC, the Blackfriars Theatre in Staunton, Virginia. And every place in between.” Buckley will premiere that robust trailer during “Hit and Run History’s Stephano Kickoff” event. The one-hour telethon will air live at 7:30 PM on the Cape Cod Community Media Center’s Channel 99 and streamed on capemedia.org. In addition to the promotional trailer featuring HRH’s work of the past two months, there will be live music and a theatrical performance before a studio audience. Hyannis-based Schuyler Grant and his band The Godspell will be in the studio for three musical numbers, and the Bay Colony Shakespeare Company will perform a scene from Shakespeare’s The Tempest. In between, HRH’s crew will stage readings from historical accounts that connect the play to actual events. Viewers will be directed to the crowdsourcing where they can pledge at various levels to facilitate the documentary. Rewards will be offered based upon the level of support. “We’re not looking to fund our whole documentary through this show,” says HRH Production Manager Jay Sheehan. “This crowdsourcing campaign will only run for six weeks. But we hope be able to raise enough to fund the first and most difficult leg of our journey, which is filming in England.”HRH will head there to trace the humble beginnings of Stephano a/k/a Stephen Hopkins. When the Mayflower sailed from England in 1620, a late-coming passenger was the only one aboard who already been to the New World. Hopkins’ life up to that point was already harrowing enough for any person. In 1609, he had sailed with the new Virginia Governor to Jamestown when their ship, the Sea Venture, wrecked on Bermuda. Later ashore, Hopkins begged for his life after condemned to death for mutiny. A newly-constructed ship carried the castaways to Jamestown, but salvation was short-lived. The handful of surviving colonists had resorted to cannibalism. Present at the marriage of Pocahontas, Hopkins returned with her and her husband to England. There, the story of the Sea Venture inspired Shakespeare, with Hopkins immortalized as the mutinous drunken butler Stephano. A decade later, his experience in North America were invaluable to the fledgling Plymouth Colony. Host to Samoset and Squanto, and emissary to Massasoit, Hopkins had seen how quickly a European settlement could fail without good relations with the local tribes. A grassroots production of the Cape Cod Community Media Center, HRH has received numerous accolades and grants for bringing global historical adventures to underserved audiences. Less Ken Burns, and more Anthony Bourdain in style, HRH is featured WGBH’s History site and broadcast on Rhode Island PBS. “Hit and Run History’s Stephano Kickoff” will be held in Studio A at the Cape Cod Community Media Center, 17 Shad Hole Road in Dennisport, MA. The event is open to the public and refreshments will be served. Because seats are limited, guests are asked to please call 508-394-2388 to reserve by 5 PM on Friday March 20. Many years ago, when people still used paper maps, I recall my excitement at the debut of the new edition of Butterworth Cape Cod Atlas & Guidebook. I was about 20 and this was a big deal, mostly because I am a map geek, and the release of a new map was akin to a blockbuster movie release. 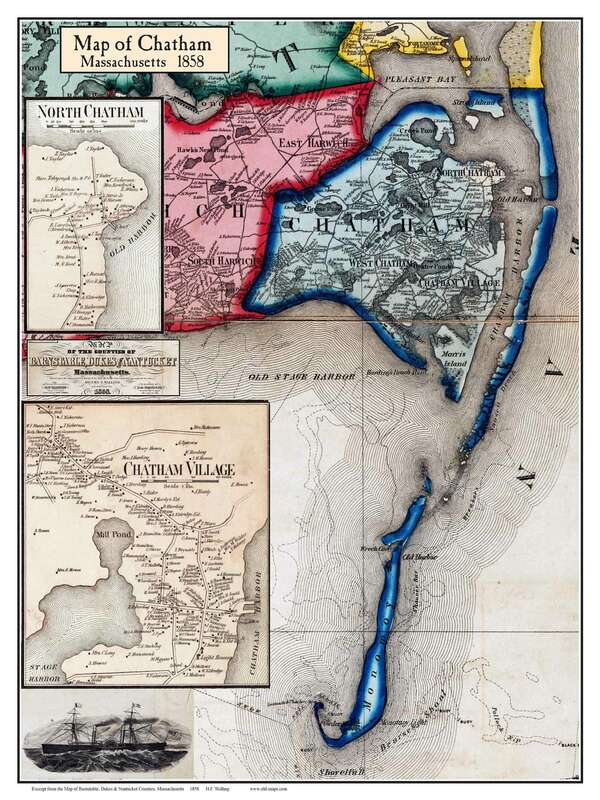 Also, this was not some far away land that was featured – it was of the Cape – and I am, for better or worse, a yokel. So it was with great fervor that, soon after turning to the map of Chatham, I found myself taking pen to paper to write to the Butterworth Map Company. Not praise them, but to take them to task with a list of corrections. The name of the road I grew up on was entirely wrong. That was annoying because when you live at the end of a tiny little road you hope UPS and FedEx and friends coming to visit will not give up. But the other point that raised my hackles was the labeling of the very northeast corner of North Chatham as “Allen Point.” I had never heard this before. To me it was always “Minister’s Point.” And so I told them. For full disclosure, the Butterworth Company provided me a great incentive. If you wrote to them with a mistake on their map, they would send you a copy of the map for free. No, I am not so much of a Yankee that I expected a map for each correction, although, certainly, I wouldn’t have faulted them for making me such an offer. Years later I found out that indeed this feature of the land has gone by both Allen Point and Minister’s Point. I prefer the latter, but might concede now I didn’t deserve two maps. Not that I ever expected that, you understand. But it got me thinking about how many names there have been for the same place. A number of local history buffs are aware that Shore Road was originally named “The Boulevard. ” Clearly, there were aspirations to swankiness when it was laid out around the turn of the last century. At the time I discovered this (and was cajoling the Butterworth Company for free stock), I was working for the selectmen and the surveyor of highways on an inventory of all the roads and ways in Chatham. It had turned out that, big surprise, the town didn’t actually own Shore Road. So it was high time we figured out what roads the town did own, what the town didn’t own, what it thought it owned but didn’t, and what it did own but didn’t think it did. Indeed, I found a number of each. The thing that would confound me, however, was the names of certain streets from around 1900. Perhaps you could direct me to Cherry Street? It runs from Main Street to the Boulevard. That could be Seaview Street. Or even Old Harbor Road. In this case, it is now known as Chatham Bars Avenue – which itself was previously Chatham Bars Inn Avenue. I suspect that prior to the building of CBI, it wouldn’t make sense to call it Chatham Bars Inn Avenue. Are there still cherry trees on Cherry Street? Realizing a map would be necessary to keep some of these straight, I created one and began to notice a theme. The aforementioned Cherry Street. Cedar Street, of course, is still named that. Pine Street, which ran from Main Street to Orleans Road. Any guesses? It seemed someone was in a mood to erase the heritage of Chatham since we know this today as Crowell Road. As I recall there was also an Oak Street, Elm Street and Poplar Avenue. If you have ever seen photos from this time, Chatham looks like South Dakota. Barely a twig in the place. You can probably guess that the names were chosen then not because they were lined with oaks or cherries or pines. OK, maybe pines, because that’s the Cape Cod state tree. But they were probably all four feet tall. Regardless, the names were perhaps more aspirational than descriptive. So maybe each street had a single tree on it, but the hope was for more. Someday. I guess I kind of like this, though. It calls forth not just what this town was like over a century prior – the image everyone wants to have of Chatham – but of a possible alternative history. A Chatham where the railroad depot still functions. Electric streetcars run down Main Street (which is one-way from Cherry Street to Victory Circle). The sailors from the Naval Air Station in Chatham Port are typically found playing ball against the Life Saving Service, and the Monomoy School is located down in Whitewash Village. A steampunk Cape Cod is a road you can travel down endlessly with Halloween around the corner. Perhaps it suits the season better to think of what could have been than to what has actually been lost. Come to think of it, that all sounds like a good idea for a map. Bearing due west at 15 miles, I caught sight of a single flashing light in the darkness. I’d seen it plenty of times, but still wasn’t sure, not having a chart handy. “What are those four lights in a row to the right of it?” my companion asked. “Chatham Bars Inn. Just up Shore Road. Those are the lights on the top floor,” I said. For the first time, I was seeing home from a totally different vantage point. At night, the light beckoned across the distance. But never this far, in this direction. Never this late, this dark. Out in the blue water of the shipping lanes, I saw Chatham Lighthouse. Certainly no closer the vessel I was on would venture. 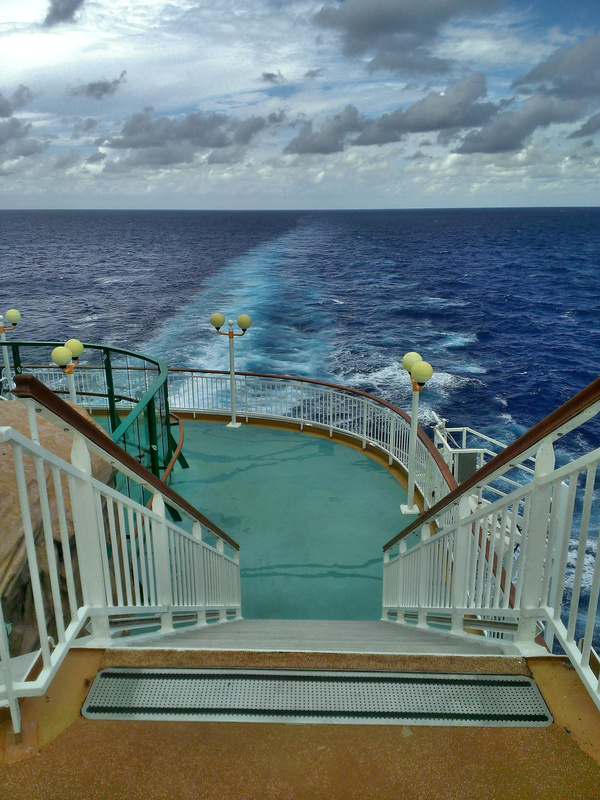 The Norwegian Dawn draws 28 feet, and even this far out we only had 50 feet at best underneath us. Just the day before, halfway to Boston from Bermuda, we were in waters 16,000 feet deep. Maybe it is the angle of the sun, or being hundreds of miles from the coastal shelf, or the Gulf Stream or the depth, but the blue water there is not just blue. It’s ultraviolet. It is unreal in its purplish hue, even more so when the foam churned up by the massive propellers of our ship bubble up like crystalline green, literally the color of too many bridesmaid dresses – sea foam. Now back in New England waters, it felt like home. Cooler, drier air. A slate hue to the ocean. I’ve always felt – scratch that – used travel as a tonic to blast myself out of routines. If you go somewhere and see new places, you ought to come back with the dial in your head moved a degree or so off where it was before. Anything less, and you were probably just playing tourist. Anything more and you may have suffered a psychotic break. Me, I was here to punctuate my sleeping in my cabin with breaks of eating great free food and naps on the balcony. For someone with more entries in my passport than my checkbook, I can get away with at least one trip every decade devoted to actual relaxation with my integrity intact. Especially for a Cape Codder when it is scheduled the last week of summer. And yet, I was standing on the rail of this massive ship doing something that was common prior to the building of the Cape Cod Canal 100 years ago, starting to connect the dots on some history and thinking about what to write about it. Passing by Chatham Light in a passenger liner – that’s a singular experience. Chatham is an end-of-the-road sort of place. You do not pass through Chatham unless you aren’t paying attention to the map. We have no highway. Our railroad, defunct decades now, was the end of a spur. Unless you are in an airplane landing in Boston, there aren’t too many times you can point to a fellow passenger and say, “You see that? 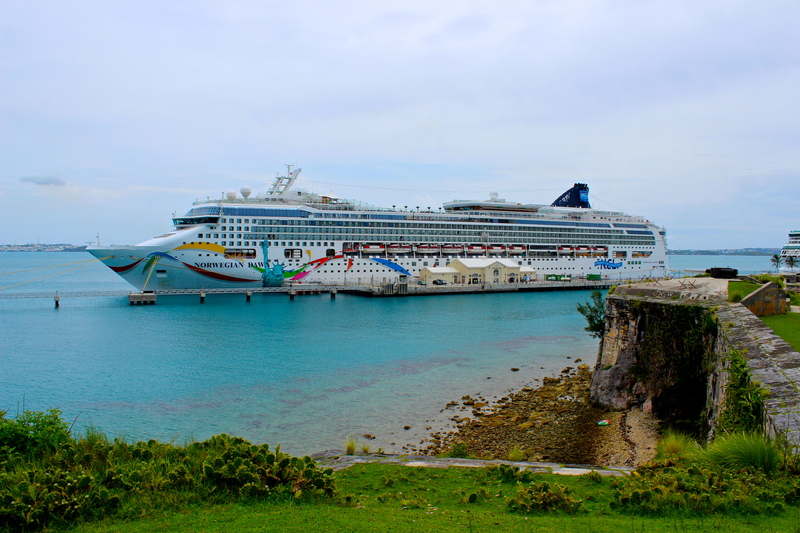 I live there – right there.” This trip had reconnected me with Bermuda -- a place of only the vaguest recollections from a family vacation when I was three years old – in the best manner I could have imagined. By sea. No flight to another part of the country, but just a two-hour drive to Boston. All travel was done roughly at sea level. Certainly I wasn’t aware as a toddler of my own family’s connection to the “Isle of Devils,” so known from its treacherous reefs. But as a boy I came to learn the connection of my ancestor, Stephen Hopkins, who had been aboard the Sea Venture, en route to Jamestown colony in 1609. The story the shipwreck at the unpopulated Bermuda was the basis of Shakespeare’s final play, The Tempest. After the survivors made it to Virginia, the disease, starvation and privation by nearby Native Americans led young Hopkins to return straightaway to London. Ten years later he would be the only man aboard the Mayflower who had actually set foot in the New World. And, as we know, that vessel was turned back from its heading of the mouth of the Hudson by the shoals off Chatham. The very waters my passenger ship now plied. From one wreck-prone area to another, with a single family member connecting them (and the greatest writer of the English language thrown in). These are the sorts of mental wanderings one is allowed when traveling slowly, at sea level. We circle back without meaning to, time and again. Partaking in Antiques Roadshow and Curious George? It now comes with a side of South American adventure. And in two different flavors, thanks to a pair of Emmy-nominated series from Cape Cod. On March 29, 2014, Rhode Island PBS begins interstitial broadcast of new episodes of two series Through My Eyes (TME) and Hit and Run History (HRH). Grassroots productions of the Cape Cod Community Media Center, both series have received numerous accolades and grants for bringing global adventure to underserved audiences. “Through My Eyes follows two elementary schoolers, Ava and Sofie, as they explore the world,” explains TME director Jen Sexton. Specifically designed for classroom use, the series has received six Massachusetts Cultural Council Grants. “Kids, parents and teachers raved about our past episodes, and told us they wanted more.” TME’s "Skipping School" was nominated for a New England Emmy in 2013. Offered the chance to accompany HRH to South America, the Cape Cod Travel Girls jumped at the chance. “To the City of Fair Winds,” TME’s first episode in the new series on Rhode Island PBS, introduces young viewers to Argentina’s exciting capital, Buenos Aires. Emmy-nominated "7,377 Miles from Home" opens HRH’s new series on Rhode Island PBS. In this episode, footage from two days of travel accompanies an interview with Samantha Addison of the Falklands Islands Radio Service, tracking from Cape Cod to New York, Chile and cross-country on East Falkland. “We lead off with a clear picture of how remote and stark this place really is,” says Buckley. Under ten minutes in length, the episodes work well for public broadcasters to program between longer shows. As public television stations broadcast commercial-free, there is typically time between the end of a full-length show and the end of the hour. Hit and Run History and Through My Eyes give public broadcasters the chance to fill that brief slot with high-quality programming that engages, entertains and educates viewers. Through My Eyes will air on Saturdays at 8:50 p.m. and Hit and Run History will air an hour later at 9:50 p.m., beginning March 29. Hit and Run History and Through My Eyes each receive an Emmy nomination! On the evening of April 30, 2013, the National Academy of Television Arts and Sciences - New England Chapter announced nominations for the 2013 Emmy Awards. In the category for Interstitial Video, two of the seven nominees were joint productions of the Cape Cod Community Media Center and WGBH-Boston. "Skipping School", an episode from elementary education travel series, Through My Eyes, was filmed in Hong Kong. The hosts, Ava and Sofie, ages 7 and 8, explored the bakeries of the city, and then are invited to join in with rope skipping teens at a local high school. Credits: Jennifer Sexton- Creator, Writer & Director, Sofie E. Buckley & Ava Hischak - hosts, Jay Sheehan - Audio Engineer, Andrew Giles Buckley, Producer. "7,377 Miles from Home" is the first in Hit and Run History's Falklands series. On the trail of the Columbia Expedition -- the first American voyage 'round the world -- the Gumshoe Historians of Hit and Run History head down to the disputed islands deep in the South Atlantic. In this episode, the crew demonstrates how very remote the Falklands are, with footage from two days of travel punctuated with an ongoing interview with Samantha Addison of the Falklands Islands Radio Service. Credits: Andrew Giles Buckley - Creator, Producer & Director, Jay Sheehan - Production Manager & Audio Engineer, T. Kane Stanton & Kyanna Sutton - Videography & Stills. Aside from the other five nominees in the Interstitial category, this pits Cape Cod's two globetrotting travel girls of Through My Eyes against the scrappy band of Cape Cod filmmakers, Hit and Run History. Who will win out? The full list of nominations for 2013 is available at the New England Emmy site.